At India we pay lot of taxes, hence we never lose a chance to locate loop-hole in our system to save tax illegally. In order to save tax sometime we forget difference between tax saving and tax evasion and land up in awkward situation. 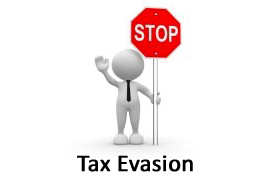 In this post I will be sharing common tax evasion that is done by people to save tax illegally. Most common tax evasion take place today is by producing fake rent receipt. If you are producing fake rent receipt you must be aware that it is mandatory to declare PAN number of your landlord on these receipts. If you submit false receipt with inaccurate information, income tax department may send you notice under section 271(1) (c) for which minimum penalty is 100% of tax evaded and maximum is 300% of tax evaded. In order to claim tax-free LTA it is quite common that employees are producing fake IRCTC railway tickets. It is very easy to make ticket like this anyone with good computer knowledge can do that. I have come across some cases where employees are fired by employer for adopting such malpractice. In order to get tax benefit in medical allowance many employee deposit fake medical bill to their employer. This will defiantly lead to tax saving, however if it is traced in income tax scrutiny heavy tax will be imposed on them. Accepting loan repayment in cash from friends and relatives and not reporting in income tax return is also tax evasion. Not reporting additional income in tax return is also tax evasion. People often ignore Interest income from saving bank account. They forget that Interest amount only up to 10000 Rs is exempted from tax. Sometime I also see that people are misusing form 15G and 15H for saving tax; however they forgot that PAN number stated in this form is enough to find all information about transaction and applicable tax. You cannot take advantage of HRA and Home Loan together. If you are doing so it is tax evasion. Dual benefit like this is allowed only if you are living in another city on rent and property brought by you is in another city. Almost 80% of people who purchase second home in same city by taking home loan do not show rent income from second home in income tax return. As per me it is one kind of tax evasion. Black money transaction is quite common in real estate and gold purchase. Hiding any type of black money transaction is tax evasion. People often forget to calculate and mention short-term capital gain in income tax return. This is another biggest source of tax evasion prevailing today. Business malpractices are quite common for tax evasion. In many small businesses it is found that sales and purchase take place in cash. No documents are evident for this type of transaction. As per me it is biggest source of tax evasion. Tax evasion is biggest enemy for our economy.We must join hands to fight against it. As a responsible Indian citizen you should pay your tax honestly.